There are many things needed in daily life that often get overlooked. Humans know that food is essential for survival, just as they know clothes are a necessity — in most situations, anyway. We wear shoes to protect our feet, turn on the air conditioning in the summer or heat in the winter, and keep tidy the homes we are so fortunate to have. All essential elements in a day in the life, all things deemed necessary for human survival. However, there are certain things that often get taken for granted. For example, how hard it would be to eat without utensils (possible, sure, but not quite as tasteful)? How comfortable would our sleep be if we didn’t have a bed? What would illuminate a dark room if it weren’t for electricity? While we see the necessity of all these things, it is still rare that we acknowledge how important they truly are. Another essential aspect of life, something often taken for granted but sorely missed when unavailable, is the ease of transportation. Through the many centuries, transportation has shifted from horses and carriages, to trains, boats, airplanes and automobiles. Although the forms of transportation have changed, some far more luxurious than others, there is little doubt that it has always been a necessity. Now, transportation has gone from a simple way to get from one location to another, and morphed into its own industry, and within that industry, a powerful subset of business leaders have emerged. Women are quickly proving that cars (and related vehicles of that nature) are not just boy’s toys. 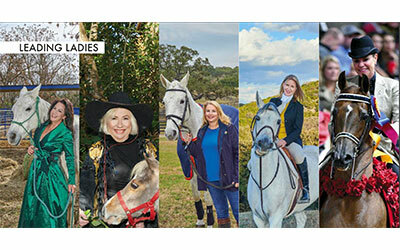 From boats used to give vibrant tours and showcase beautiful locations, to buses fit for travelers and soldiers alike, to ridesharing options that have the power to prevent alcohol-related crashes and reduce congestion in busy cities, four San Antonio women are making strides in the transportation industry, breaking ground in what has traditionally been a man’s world. For Janet Peavy, market manager of Lyft San Antonio, June Bratcher, founder and CEO of Daisy Charters and Shuttles, and Hope Andrade and Lisa Wong, the women who run Go Rio Cruises, this quote is more than just a nice sentiment. It’s the definition of what they have done and continue to do in the transportation industry. After finding the job posting a year ago, Peavy said she researched the company values and found in Lyft a perfect match for her passions. “As a marketer, I’ve always been really interested in the next wave of technology,” she said. “This really seems to be where transportation is going in the next few years, and that’s exciting to me. To have an opportunity to shape a market and develop that in conjunction with city leaders is really exciting.” While the technology aspect of her job is something she enjoys, Peavy’s cheerfully compassionate personality shines through when she begins talking about the community she is part of. “I had spent years in the nonprofit world raising money for the community, and the chance to combine my passion of cutting edge technology and the ability to do something positive for the community with that technology — it was really cool,” she said. For all the bases Peavy covers as the market manager, it is no small wonder that she manages to keep a smile on her face and maintain her positive personality. As with any job, Peavy said there are times when situations can be challenging, or people can be difficult to work with. However, true to her nature, Peavy said there are ways to look at the challenges that aren’t negative. “There’s always struggles, and people that have different ideas, but that’s part of the fun of it, too,” she said. “I prefer to look at it as fun, like it’s a puzzle you need to solve, because people aren’t inherently mean or difficult. They just have different ideas than you, and once you figure that out and see what the common ground is, you can solve just about anything.” As a mother of one son and three daughters, Peavy said she takes her role as a woman in transportation very seriously. She said she has often walked into a conference room and been the only woman there, and while the idea of it may be frightening for some, it’s exciting for Peavy. “I like that idea, that I’m kind of breaking ground a little bit, because as women we’re still breaking ground,” she said. The idea of breaking ground is a very important lesson Peavy said she wants to instill in her children. “I want to let them know they can do whatever they want to in life. They don’t have to feel bound by traditional roles or things like that. 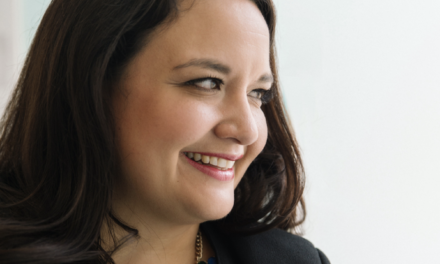 If they want to go do anything, just go do it.” It’s a lesson Peavy has taken to heart, as evidenced by the role she plays within Lyft and the transportation industry itself. Nestled on the east side of San Antonio sits a quaint, colorful office. Surrounding the small building are vehicles familiar to anyone who has spent time on Texas highways. A fleet of buses with the name “Daisy Charters and Shuttles” emblazoned on the side are parked in the lot, sparkling clean and shining in the Texas sunshine. It’s an interesting sight, this cozy office surrounded by towering buses, but here sits the home base of a six-million-dollar bus company that began as a humble endeavor in the kitchen of June Bratcher. 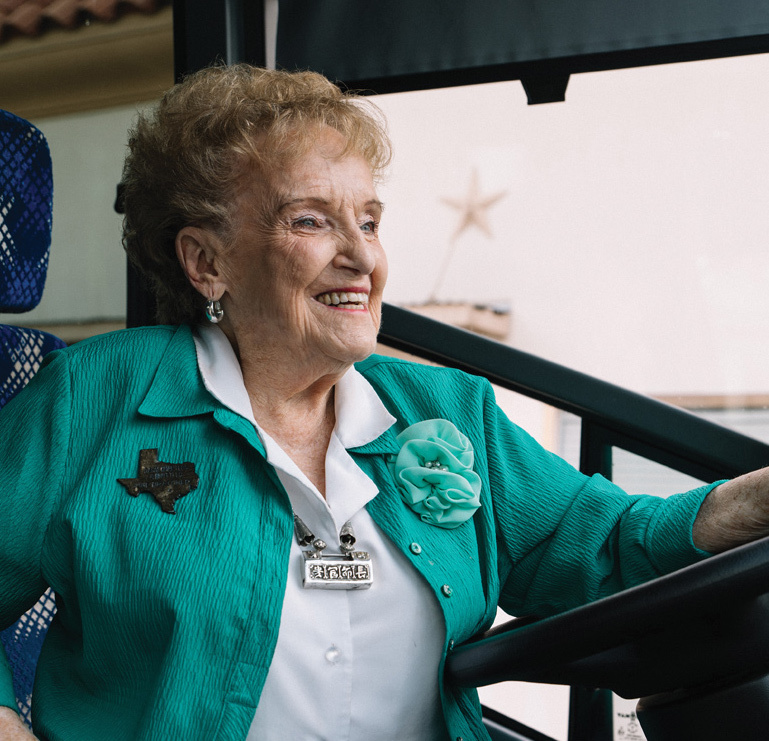 The woman at the helm, who has been running the brigade of buses since 1980, has more than a few stories to tell from her 39 years as CEO of Daisy Charters and Shuttles. Armed with the yellow pages and $200 she saved from the family grocery money, the then 48-year-old began building her empire one phone call at a time — but not without a few hiccups getting started. “I nearly died,” Bratcher said with a laugh. The relief in her voice is still palpable, even after all these years. “I was so happy, and I didn’t look at Greyhound or Kerrville because I knew them personally. I looked straight ahead, went outside the door, and Kim and Frank” — her daughter and one of her drivers, the two people she had brought with her to apply for her permit — “were jumping up and down and screaming. That afternoon, we blew $0.25 a piece on a pizza to celebrate.” Bratcher explained that now, each of her buses are given a number beginning with 25 “to remind us of our humble beginnings,” she said with a coy smile. After she was issued her permit, Bratcher was able to purchase buses of her own, the beginning of her fleet, and has grown it for nearly forty years. Through those years, Bratcher has overcome numerous ordeals, from being held at gunpoint — “That was very traumatic,” she recounted offhandedly as I sat in near-comical shock — to fighting for her drivers in a sexual harassment lawsuit. With the same fighting spirit that Bratcher applied to everything else in her business, she set to work on creating a bid to apply for the military contract. With the aid of two good friends, Bratcher put together a bid and submitted it, with little hope Daisy Charters and Shuttles would win. When it was announced at 10:00 the following morning that she had been awarded the contract, Bratcher was shocked. “All the men started talking to me and they said, ‘June, why did you do that?’ and I said, ‘You remember that ad when we were at war and Uncle Sam said, “Shh, you don’t know who you’re talking to”? Well, you don’t know who you’re talking to,’” she recounted with a chuckle. In her many years of business, it seems there is little that Bratcher has put her mind to that she hasn’t accomplished. When it came to finally getting her loan, Bratcher again fought for what she knew was right. During a two-month class for female business owners at Kelly Air Force base, Bratcher put together a 39-page application for a loan. She took it to her bank, and they laughed before taking her application and looking it over. “They came back and two loan officers came with them,” she recalled. “They said, ‘Mrs. Bratcher, who did this for you?’ I said, ‘I did this for me. Ask me anything about it, anything you want to know, ask me about it.’”They did, she said, and she was able to answer every one of their questions. After another brief meeting, they came back and told her they would loan her $125,000 on her name. “I said, ‘Okay, that’s wonderful. That’s exactly what I need,’” she said with a laugh. From there, she was able to buy her buses, and she has never looked back. The new operators of the River Walk boat tours take their jobs very seriously, having been awarded a 10-year contract by the City of San Antonio just over a year ago. Of course, ask them their job title and they’ll give you different descriptions. “When people ask me, ‘What are you doing now?’ I say, ‘Well, I’ve gone from everything I’ve done to a River Rat now,’” Hope Andrade said with a big laugh the morning of our meeting. visitors to the River Walk may have noticed. The two have worked incredibly hard in the last year to take the traditional river tours and step them up a notch. They have introduced fitness cruises, offering early morning yoga as well as spin classes. They’ve also designed specialty cruises that offer brunch, cocktails and dinners, and, specifically for the upcoming holiday season, they’re offering Coco Cruises, during which they’ll serve hot chocolate and home baked goods. They plan to offer one from the Pearl as well, called the Pearl Lights. For Andrade, it’s the interaction with the guests that brings her the most joy. “I love getting to hear the visitors’ comments. The feedback about how beautiful our city is, how warm and friendly everyone is, how clean the river is…” Andrade trailed off, a smile on her face. “I promise you that I’m a foot taller since I’ve been on the River Walk, from just the pride of hearing those comments.” After an active first year, Wong and Andrade are gearing up for a second round. 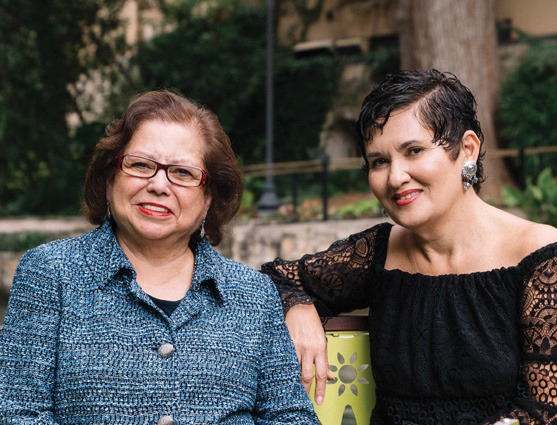 They invite everyone, local or visitor, to return to the River Walk, whether to experience it for the first time, or to rediscover the treasure San Antonio is so fortunate to claim. For example, when the NCAA Final Four was hosted here in March, the River Walk and Go Rio played a special part in showcasing the beauty of the Alamo City in a way that was uniquely San Antonio.